of the CAS, v. v. i. The Department of Functional Ecology, Institute of Botany, Czech Academy of Sciences organizes a PhD course of functional ecology „Go belowground!“ from 15 to 21 September 2019. The course will be focused on theoretical background and practical assessment of plant functional traits which can be found on belowground plant organs in temperate herbs. The application period is open until the end of April. Find out more. Platform for the Landscape coordinated by the Institute of Botany of the Czech Academy of Sciences invites you to the conference Agroforestry – an Environmental and Production Alternative in Agriculture that will take place on April 18 2019 in the building of the Czech Academy of Sciences. It is organized by the Czech Association for Agroforestry under the auspices of the Ministry of the Environment, the Ministry of Agriculture and the Commission for the Environment of the Czech Academy of Sciences entitled. The main objective of the conference is to present existing best practices, research results and policy in countries where agroforestry systems are already in place and subject of research. To register, use the form by 10 April 2019 at the latest. 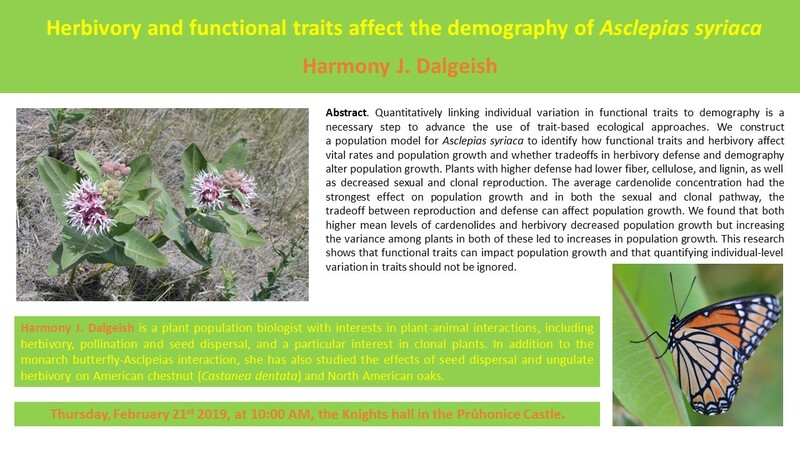 On Thursday 21 February 2019 at 10 a.m. Dr. Harmony J. Dalgeish will give a talk on Herbivory and functional traits affect the demography of Asclepias syriaca in the Knight’s hall of the Průhonice Castle. Workshop will be held at the Institute of Botany of the Czech Academy of Sciences, Průhonice, Czech Republic, during 27 February to 1 March 2019 as a part of COST Action CA16219 HARMONIOUS – Harmonization of UAS techniques for agricultural and natural ecosystems monitoring. On Wednesday 27 February, workshop with COST Action Lectures and invited speakers will be open to public. Find out more. Destructive typhoons are moving poleward. This is the main finding of the study, which documents that the destructive impact of typhoons is moving to new areas on the long-term scale. The study was published by an international team of researchers, led by Jan Altman from the Institute of Botany of the Czech Academy of Sciences, in the prestigious journal PNAS published by National Academy of Sciences of the USA. Publishing house Academia released book “ Temperate herbs: an architectural analysis“ by Jitka Klimešová who is focusing her research at the Institute of Botany on functional morphology of plants. Rhizomes, tubers, bulbs and roots of herbaceous plants are overlooked not only due to their position in the soil but also because they are wrongly considered unimportant. This book focuses on these belowground organs as they are responsible for key ecological functions of temperate herbs, like overwintering, clonal multiplication and resprouting after disturbance. In the week of Sept 16-22 2018, scientists from the Department of Functional Ecology of the Institute of Botany in Třeboň (Jitka Klimešová, Jana Martínková, Arinawa Filartiga and Ondřej Mudrák) organised international PhD course of belowground functional ecology “Go Belowground!“. The main goal of the course was to introduce functional importance of overlooked traits on belowground organs like clonal multiplication, bud bank size, and plant longevity. A new book by authors from the Institute of Botany of the Czech Academy of Sciences and their colleagues providing new insights into the anatomy of high-mountain plants has been published by Springer. A database of Czech flora and vegetation prepared by Masaryk University, the Institute of Botany of the Czech Academy of Sciences and University of South Bohemia has been launched at www.pladias.cz. What can you search for? At the BES Annual Meeting, Ken Thompson, Editor for Functional Ecology, caught up with Jitka Klimešová from the Institute of Botany of the Czech Academy of Sciences and discussed her work on a recent Functional Ecology paper, Herben et al’s Effects of disturbance frequency and severity on plant traits: An assessment across a temperate flora. A field guide to the flora of the semiarid region in the Transhimalaya of Northwest India by authors from the Institute of Botany of the Czech Academy of Sciences has been published by Academia. It can be widely used also in mountainous areas of West Tibet, Kashmir or Nepal. 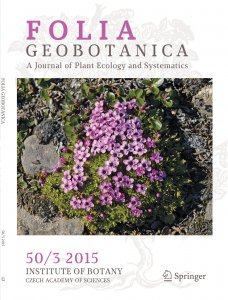 In the collection of papers in this special issue on the ecology of clonal plants, several papers that explore new ideas that could inspire further research into the role of clonality in plant ecological strategies have been included. See the contents. On Thursday, 18 January 2018 the president of the Czech Academy of Sciences Eva Zažímalová presented honorary medals to three distinguished scientists. The Gregor Johann Mendel Honorary Medal for Merit in the Biological Sciences was presented to prof. František Krahulec from Institute of Botany. A modern synthesis edited by Aaron Ellison, Harvard University, and Lubomír Adamec, Institute of Botany of the Czech Academy of Sciences, has been published by Oxford University Press. With contributions from the world’s leading researchers in the field it summarizes the latest research into the physiology, ecology, systematics and evolution of carnivorous plants and provides an agenda for future research. Find out more. Radim Hédl from the Institute of Botany participated in a study elucidating mechanisms of functioning of tropical rainforests in Borneo, acting as atmospheric carbon dioxide sink. The study was published in Nature Communications. 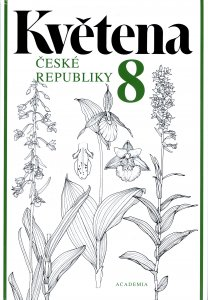 The first comprehensive summary on flora and vegetation of the Czech Republic, edited by botanists from Faculty of Science of the Masaryk University and Institute of Botany of the Czech Academy of Sciences has been published by Springer. The Highly Cited Researchers list represents some of the world’s most influential scientific minds. These researchers rank in the top 1% by citations for field and publication year in Web of Science. This year, ca 3300 researchers are listed, only 4 of them are from the Czech Republic of which three are from Institute of Botany of the Czech Academy of Sciences: prof. Vojtěch Jarošík (†2013), prof. Petr Pyšek and Ing. Jan Pergl. Their research focuses mainly on invasion ecology. Currently there are no articles available. Currently there are no vacancies available.